What time of year are coyotes more active? Do coyotes hunt in the pack? Will coyotes eat other coyotes? Want to know when do coyotes hunt or how this ghost of the city hunts…..? 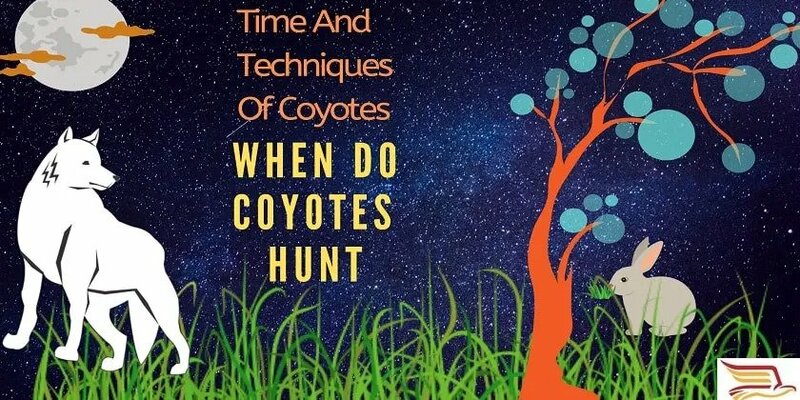 Well in this article we will be knowing and discussing the time of the hunting and the hunting techniques of a coyote. It will be really correct to say that they have become a ghost in the city because of their habit and talent of roaming in the nighttime for getting food, particularly in the urban areas. When they are in the wild, any of us can feel great amazement if we see them hunting. In the wild, where its minimal human activity, they can be active to hunt throughout the day and also in the night. The perfect suitable time for a coyote to hunt is dark and during the morning time in urban places. They prefer hunting in the night and relaxing in the daylight but it doesn’t mean they don’t hunt in the day. The reason behind finding food in the night especially in the urban location is to avoid being visible to the humans. It is a feeder which will be doing anything to get its food. This member of dog family primary lived in open prairies and desert but now they have colonized in the cities like Los Angeles and almost in every part of United States, except Hawaii. In the cities and the urban areas they sometimes attack the pets and kill them in the daylight. Since they have entered the urban parts of the United States, they have become habitual of hunting in the daylight and sleeping in the night. In other words, they have become adaptive to the human environment. The hunting behaviour of a coyote is very different from other animals in the wild. However, they do hunting alone as well as in pack. During the hunting, they don’t make so much noise while downing the prey because it may let their competitor know they have made the kill. Especially when they are in the wild the small mistake can bring their predator near the kill. You know what do coyotes eat….? A coyote can prey on a small and medium-sized animal only. Besides that, they hunt in the pack for large prey. Among larger wild animals, coyotes tend to kill a young and inexperienced animal because those are easy to get down. What I have noticed about them is they are nocturnal or crepuscular so they are most active from late evening to early morning. With the beginning of winters, coyotes become more active. During the winter they become less nocturnal because they mate in late winters so for that they keep themselves with pack and travel together. Their mating season starts from the end of December. So from December onwards to till mid-March, there are chances you may see them in countable numbers. If you think that coyotes hunt in the pack only then you are wrong. The truth is, coyote hunts alone and in pack both and that totally depends upon the size of prey. If there is some big animal a single coyote will never dare to hunt it because it knows if it does so, its life can be in danger. When it comes to the larger prey they hunt in a pack. Besides that, if there is some small and medium size animal they can hang it down alone without any help of the pack members. While hunting a prey a coyote always keeps its eyes on predators and its competitors. When they hunt alone them always be so possessive for its kill and avoid sharing with the other members of the pack. On the other hand, if a kill is made by the pack, it’s shared among them. In the pack they can kill a big animal easily and travel with the pack is safer than being alone. Sometimes a coyote may put its life in danger while hunting alone because there are so many predators around especially in the wild. Besides that in urban and city or nearby area, they see in the pack very often. In the night time you may encounter or see them but they avoid being visible to the human in daylight. Pack members fight so rarely and avoid killing each other but if there is some other coyote that really doesn’t belong to the same pack there are chances of a fight among them. During the fight, one is killed and becomes the food of others. This animal is cannibal that means it can kill and eat its own species and eat them. There are many incidents I have heard from coyote hunters during my research. They say they kill a coyote and leave it in outside or in the night, and saw other coyotes eating the dead one. Coyotes hunt and kill many cows, deer, rabbits, elk and pets and eat them so it seems important to control their population. Many of the hunters are taking them down and killing coyotes on the daily basis. You know when do coyotes hunt and about their hunting techniques…..? If you have any information about it, feel free to share with us below in the comment section. Let us know if this article was helpful for you. I have a pack of coyotes that live on my ranch recently one of my horses was injured he is a big animal but had bite marks all on his legs and underside I am not sure if coyotes did this I have counted 8 one evening a momma & 5 babies half grown and 2 other adults what should I do? Coyotes usually avoid attacking large animals, make sure if the marks on the leg of your horse are coyote’s marks. If they have attacked your horse, you actually need to be worried. Killing them is the only option that you have. If hunting is allowed in your area, hunt them down. If you can’t hunt them, you may take the help of some professional hunter in your locality. If hunting is not allowed, contact with nearby police station or wildlife centre for help.